West Ham midfielder Shaun Newton has been suspended for seven months after testing positive for cocaine. The 30-year-old provided the positive test following the FA Cup semi-final against Middlesbrough on 23 April. The Football Association said he would be subject to target testing throughout the suspension, which began on 20 May. "We will continue to support Shaun through this difficult time but he will also face internal disciplinary action," said Hammers boss Alan Pardew. "It infuriates me to hear of drugs-use in any sport there is absolutely no place for it and for it to occur at West Ham hurts and saddens me. "However, our priority is to help Shaun not abandon him. We will stand by him." 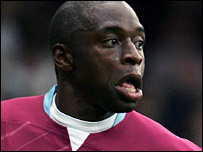 Newton, who joined West Ham from Wolves in March 2005, apologised for his actions. "I have let down my family, friends, the club and its supporters, and for that I am truly sorry," said Newton. "It was an isolated incident but I must face up to my responsibilities. "I in no way condone the taking of drugs and hope that my experience will act as a deterrent to others." Owing to the three-month summer break, Newton will miss just four months of competitive action and he is expected back in December. A statement on the Hammers website said: "West Ham United regret to announce that midfielder Shaun Newton has been suspended for seven months by the Football Association after he failed a drugs test. "He was suspended by the club on 20 May pending the FA investigation and the ban will apply from that date. "The suspension was announced today following an FA Disciplinary Commission hearing on Tuesday." Newton was not among the West Ham party travelling to Sweden on Wednesday for their pre-season tour. PFA chief executive Gordon Taylor told Sky Sports News: "He is an experienced professional but this is the price he is having to pay. "Players are told the rules at the beginning of every season and there really are no mitigating circumstances." Nine days ago Wolves striker Chris Cornes was handed a six-month ban after traces of cocaine were also found in a random test.